My name is Sharon Chance. I live in Coventry Warwickshire. 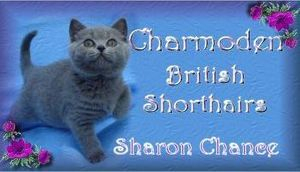 I have been breeding and showing British Shorthairs for over 25 years. I am today as passionate about the breed as the day I started. I have bred over 80 titled cats in that time.I breed self’s Bi colours, and tabbies in all colours.